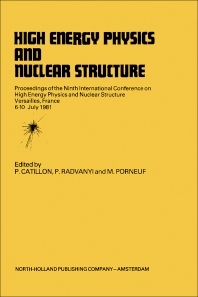 High Energy Physics and Nuclear Structure covers the proceedings of the Ninth International Conference on High Energy Physics and Nuclear Structure, held in Versailles on July 6-10, 1981. The book focuses on the processes, reactions, and methodologies involved in high energy physics and nuclear structure. The selection first offers information on experiments on antinucleon-nucleon, baryonium, nucleon-nucleon, and dibaryons and the quark model pion and the goldstone pion. Discussions focus on antinucleon-nucleon and baryonium, nucleon-nucleon and dibaryon, and spontaneous breaking of chiral symmetry. The text also ponders on quarks and nuclei, multiquark resonant states, and electron scattering from complex nuclei. The publication elaborates on electromagnetic interactions on light nuclei, electromagnetic interactions with nuclei at high momentum transfer, and inelastic electron scattering at low energy. The book also touches on the dynamics of hadron nucleus interactions, hypernuclei and interactions of kaons with nuclei, and pion-nucleus scattering theory. The selection is a dependable reference for readers interested in high energy structure and nuclear physics.